So I've known for a while that long-form blogging was quickly becoming archaic in this age of 140 characters or less. 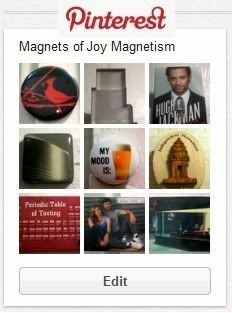 Therefore, after 1,324 magnets faithfully blogged upon, I've now picked up where I left off with Magnet #1325 on the Magnets of Joy Magnetism pinboard on Pinterest. Come follow me there! Of course, I'll miss telling all the fun stories behind the magnets, but I'm thinking this will be a great time to re-stock a treasure trove of fun stories and happy memories.